South of Waldport, Oregon, Wild Child and Trike Hobo fly along, watched by Crow. 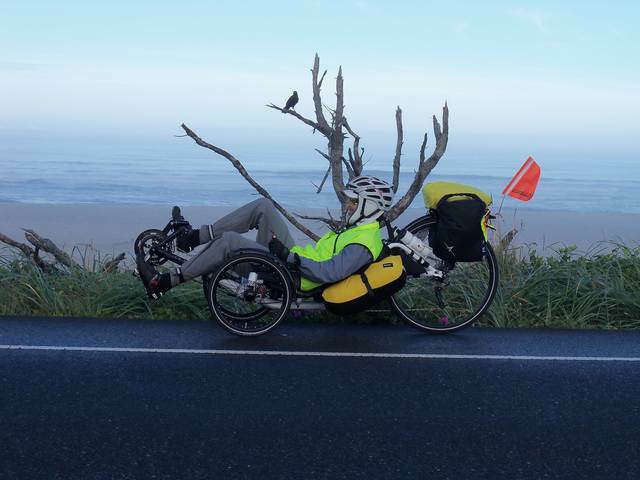 September 2014 found me pedaling my new Catrike 700 from the Clatsop Spit on the Columbia River South Jetty to Florence, Oregon. 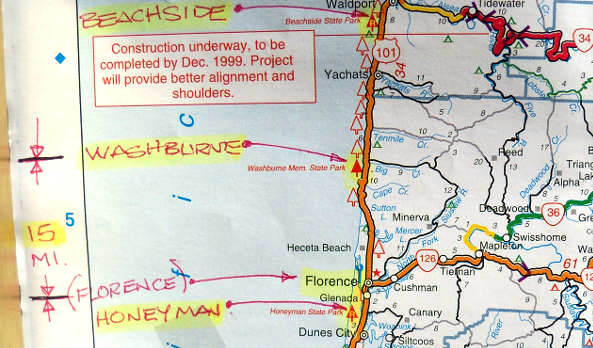 This is the northern Oregon Coast Bike Route once on Highway 101. I began at the Jetty however so I could ride the entire coastal route. This small bit of sand between the Columbia River and the Pacific Ocean is the farthest northwester spot in Oregon. Total mileage for this ride was roughly 215. 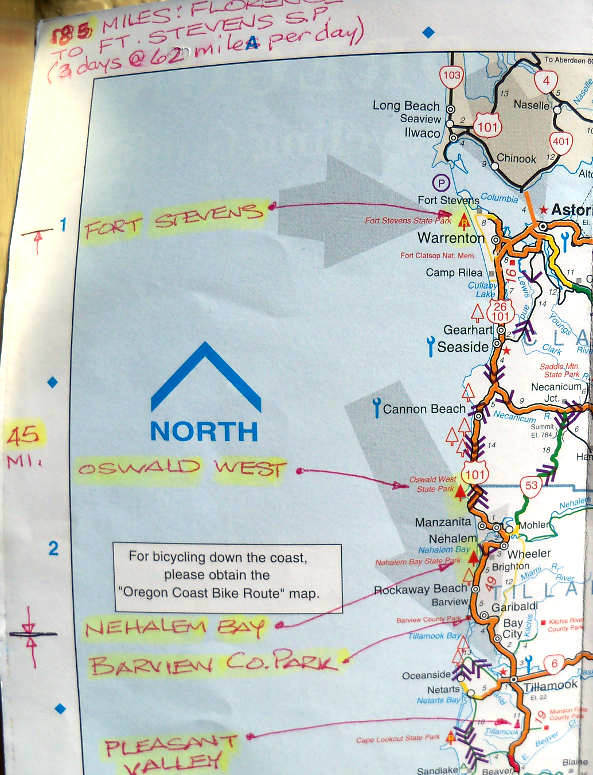 Here are some maps, followed by photos of this ride. By the way, the Catrike 700, lightly loaded, was the most enjoyable trike touring setup I’ve thus far ridden. It was light, fast, and pretty much effortless compared to my former days of heavier packing on a slower trike. This trike is made for speed, yet it works well for lightweight folks with less cargo. 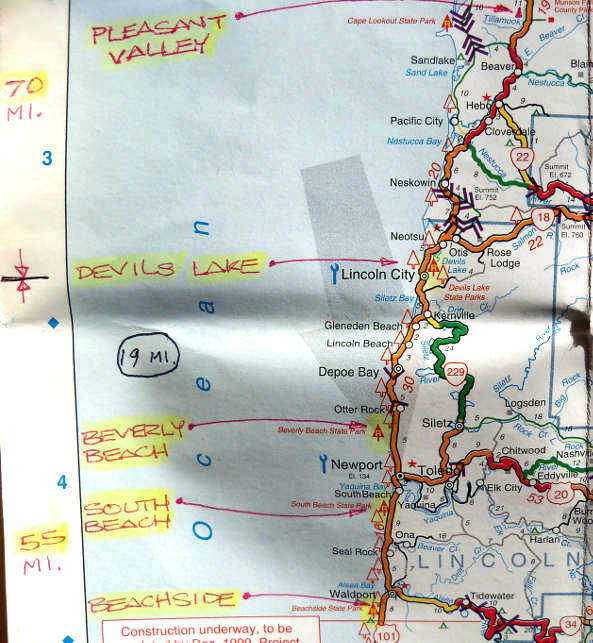 The 190 miles can be traveled via human powered tricycle by a fit rider in three days, at 63 miles per day, but I devoted five days at a more relaxed pace.